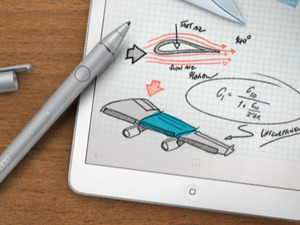 The pressure-sensitive pen would be an optional feature in Apple’s long-rumored larger tablet, now expected to begin production in September or October. Apple could get back to its graphic design roots with a Force Touch stylus for the long-rumored iPad Pro. According to KGI Securities analyst Ming Chi-Kuo, the pressure-sensitive stylus will be an optional feature in the larger iPad, which is rumored to have a 12.9-inch display with 2732-by-2048 resolution. Kuo believes Apple will begin mass-producing the iPad Pro in September or October of this year, 9to5Mac reports. Kuo has a decent track record with Apple rumors, for instance predicting the larger iPhone 6 with a 128GB storage option but no sapphire display. However, he’s also been proven wrong on occasion, such as when he expected a cheaper iMac and an 8GB iPhone 5s at this year’s Worldwide Developer Conference. Still, this isn’t the first sign that Apple will embrace iPad styli. A previous AppleInsider report claimed that Apple would offer a Bluetooth stylus with pressure-sensitive input, and Kuo himself has previously predicted a stylus that was chargeable by Lightning cable. An Apple patent application from earlier this year also described pressure-sensitive controls for a virtual paint brush, possibly with stylus input. Force Touch is the marketing lingo Apple uses to describe the pressure-sensing technology that the company has built into several of its products. The Apple Watch uses Force Touch to dismiss notifications and bring up hidden menu options, while the 12-inch MacBook and 2015 MacBook Pro trackpads use ”Force Click” gestures as shortcuts for certain commands. Apple is also rumored to be bringing Force Touch to its 2015 iPhones. Why this matters: While some pundits may scoff at the idea of a tablet stylus—given Steve Jobs’ well-known disdain for them—their inclusion in an iPad Pro would be justified if it unlocks new uses beyond just general operation. Third-party digital pens are hugely popular on the Mac for graphic designers, and it would make sense for Apple to bring that functionality to the iPad as it tries to turn the tablet into a better tool for work.